Cut three 9″ ready-made piecrusts in half. Line six 3.5″ spring-form pans by pressing each half into the bottom and sides of the pans. Close seams carefully and form a double-thick collar above the sides of the pans. Pinch dough to form a rustic scallop about 1/2″ above the rim of each pan as shown above. If not baking immediately, cover and refrigerate. Saute 1 medium chopped onion in olive oil until tender. Add 8 oz coarsely chopped mushrooms, 1 chopped red pepper, 1/2 tsp salt, 1 tsp pepper, 1/8 tsp nutmeg, & 1/8 tsp cayenne pepper. Cook until vegetables are tender. Add 9oz fresh baby spinach and cook until just wilted. Allow to cool, cover and refrigerate. Grate 8 oz extra-sharp white cheddar. Wrap and refrigerate. Mix 6 eggs, 2 tsp dijon mustard, and 1 1/2 cups half-and-half. Cover and refrigerate. Place a little cheddar in each pan. Cover with vegetable mix, then top with remaining cheddar. Pour custard mixture over and sprinkle with grated parmesan. Bake at 375 on a cookie sheet for about 45 minutes until puffy & golden. Let rest a few minutes, remove sides of spring-form pans, and use a spatula to transfer to serving plates. 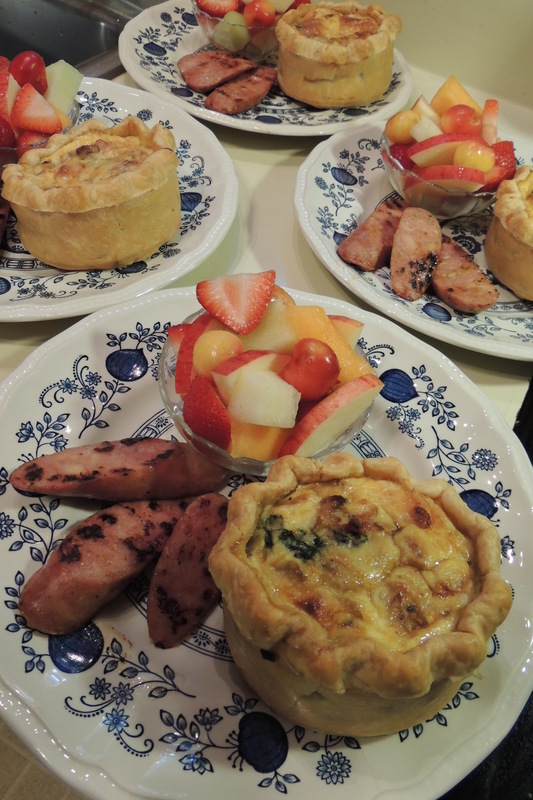 I like to serve the quiche with chicken-apple sausage cut diagonally and grilled. 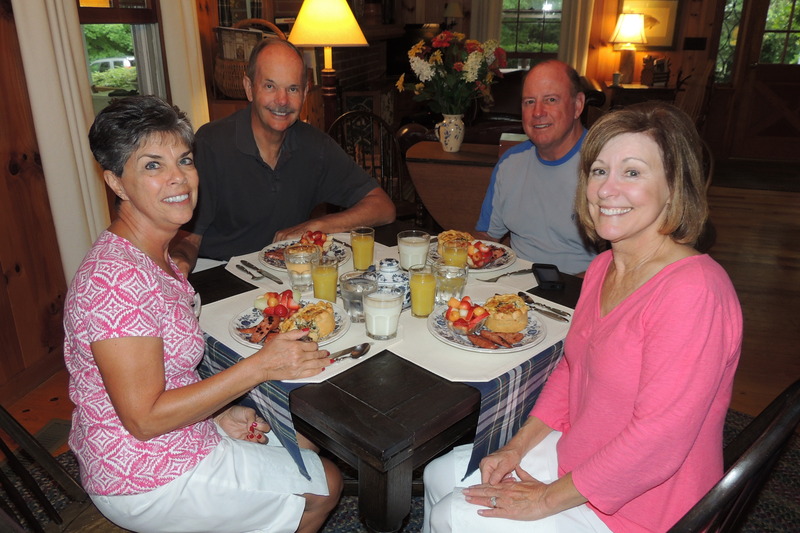 And of course, no breakfast at Colonial Pines is complete without fresh fruit, coffee, tea, and juice. My usual homemade breads are saved for another day since, in this recipe, the crust is so generous. 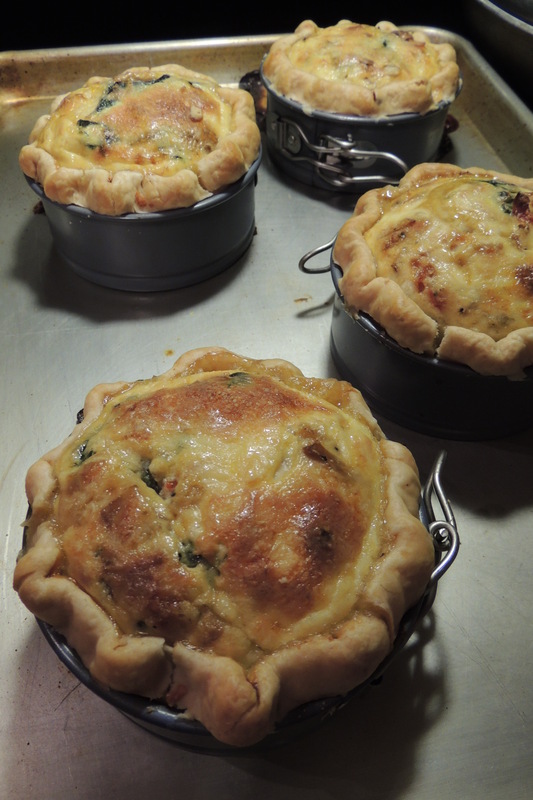 Happy Guests from Tennessee enjoyed the Quiche Primavera. After this hearty breakfast, they went to The Bascom, shopped, hiked, visited waterfalls, and skipped lunch!!! I always recommend a custom blended yogurt from SweeTreats (near Main Street overlooking Mill Creek) to get you through until dinner. See – it was worth it, wasn’t it? Better yet, be our guest at Colonial Pines Inn sometime when things aren’t so busy and I’ll make it for you! I never serve this one when I have a crowded dining room, so come during the week in a month like May, September, or November.